The Texas Christian University (TCU) tree lighting is a long standing TCU Christmas tradition that began in 1890. There is much history about this event and the activities that it includes. When the tree lighting first began it was held on the steps of Sadler Hall and was an intimate celebration among students, faculty, and their families (1). The tree lighting took place the week following Thanksgiving, usually around early December. A 20 foot real tree would be lit up in decorations, while students and staff could indulge in hot cocoa, enjoy candy canes, decorate Christmas cookies, and sing along with Christmas carols. The tree would then remain to stay lit every night in December (3). The 1999 tree lighting was also the first year that TCU began to decorate the columns of Sadler Hall in lights (8). With these lighted columns came the “Light the Campus” event. This event was a holiday decorating competition among the residence halls and the winners of the competition would be announced during the tree lighting ceremony. As the tree lighting event continued to take place over the years, local high school choirs would come and sing for the night. Furthermore, in the early years of the celebration usually around 500 to 1,000 people would attend (1). Every few years the TCU tree lighting event would change slightly or something new would be added. According to the “TCU This Week” news article from 2008, a new event was the addition of a real reindeer. This animal was brought in for the crowd to enjoy, specifically for the night of the tree lighting. 2008 was also the first year that two trees were featured at the tree lighting. The second decorated tree was located in the main TCU campus commons, in front of what is now called Brown Lupton University Union (18). The TCU Order of Omega greek honor society is the organization that started to put on the tree lighting and has been in charge of the toy drive event ever since the first tree lighting (1). When the tree lighting first began, the major focus of the event was to collect toy donations and provide them to children in need around the Fort Worth community. In fact, in 1989, TCU’s Order of Omega decided to co sponsored the tree lighting with Bank One. Banks One’s "Spirit of Christmas" program, was the organization responsible for providing underprivileged children with toys (2). In order to participate in the donation, TCU students could pick up a "wish card" in the weeks before the tree lighting, which had the toy that a child wished for. The student who picked up that card was then responsible for purchasing that gift, wrapping it, and bringing it to the tree lighting. After the tree lighting concluded, the donated gifts would be brought to numerous Bank One locations, so that the gifts could be distributed to the children (2). As stated by the "TCU This Week" news article from 1999, when the actual lighting of the tree concluded, the crowd would form a human chain that formed from the tree to the Bank One truck. This human chain would help pass the donated toys to the truck in order to prepare the trucks for delivery. The human train tradition continued on for many years, but currently no longer takes place. Currently, TCU’s Student Government Association (SGA) continues the tradition of collecting donated toys for children in need during the weeks leading up to the tree lighting. They set up an "Angel Tree", allowing any person to buy the gifts off a less fortunate child’s Christmas list. All the gifts received then go towards the Order of Omega, which benefit child protective services (1). Another aspect of the TCU tree lighting are the live musical performances. Even in the early years of the tree lighting, music was featured. The first tree lightings often included a small local choir or local student performer. According to the "TCU This Week" news articles from 1997 to 2000, some of the early performances included, the Word of the Truth Gospel Choir, Darryl MacQuiarre (a current TCU student guitarist at the time of his performance), Katherine Barnes (another TCU senior at the time of her performance), the Focus Band from Christ Church Chapel, and the O.D. Wyatt High School choir. During the early years of the tree lighting, the performers were brought in to lead the caroling, therefore the crowd would sing along to Christmas melodies with the band or performer (1). In the most recent years of the tree lighting, TCU has brought in more large scale bands and famous performers that perform their own songs with a mix of Christmas songs. These bands offer more of a performance rather than leading a caroling event (1). For example in 2006, Tyler Hilton, who played the role of Elvis in the movie "Walk the Line", performed at the TCU tree lighting. In addition, in 2017, the Los Angeles-based music duo, Johnnyswim, performed at the annual tree lighting. 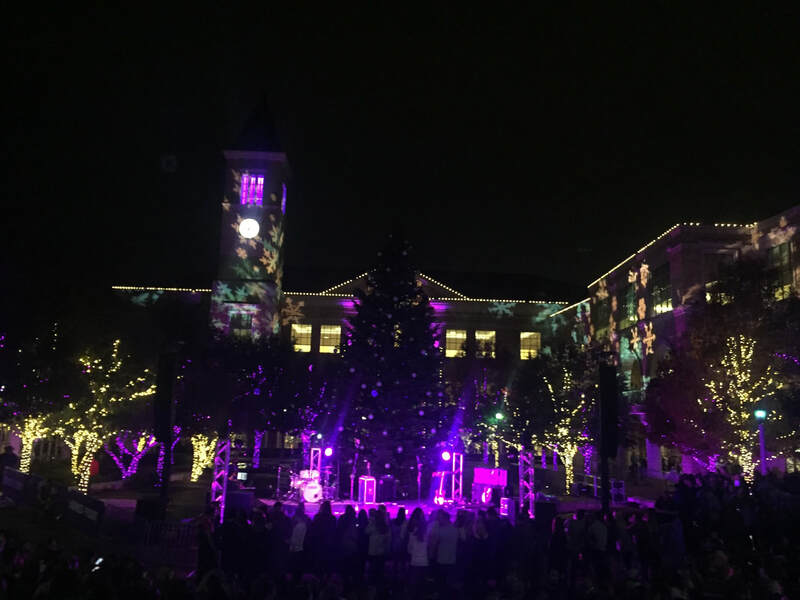 Brad Thompson, the Assistant Director of Student Activities at TCU, mentioned that organizers of the tree lighting wanted the ceremony to be more of a concert-tree lighting with live music as a main attraction. In fact, Brad Thompson stated that, “‘While music in the past has been in the background, it’s more like the highlight focus of the tree lighting this year,’” (19). There is much preparation that goes on behind the scenes in order to put on the annual TCU tree lighting. Brad Thompson has held the responsibility for the tree lighting ceremony for the past 9 years. He works with TCU’s Student Government Association (SGA) to help put on the event. The members of SGA are also the individuals who volunteer at the event and are responsible for funding it (1). Even though the event does not take place until after Thanksgiving break, SGA starts planning during the month of May. The event budget ranges anywhere from 30,000-60,000 dollars, depending on the year and the expected crowd size. In the most recent years, the audience has been between 10 to 12 thousand people (1). Advertising is another important aspect of planning and holding this event. SGA places yard signs around campus, promoting the event to current TCU students. The TCU social media accounts of Instagram and Twitter also help communicate the details of the event with TCU students, TCU Alumni, the local Fort Worth community, and others who have a connection to the University. In addition, according to Brad Thompson, within the last four years the annual tree lighting ceremony has featured a firework show. In fact, as stated by a current TCU student, Race Collins, “‘My favorite part was easily the fireworks show. I thought that TCU did an awesome job with it and it looked really cool,’” (20). TCU did not include fireworks when the Christmas tree lighting began in the early years. It was not until about a couple years ago that fireworks were added to the event. When the tree lighting first began in 1890, the tree to be lit was a 20 foot tall real tree that was brought onto TCU’s campus to be decorated for the students to enjoy. The tree itself has always been brought in from an outsource (3). In fact, at the tree lighting of 1995, According to Jay Hilscher at Hilscher Nursery & Garden Center, “the tree's humble beginnings originated when it was planted 20 years ago. The tree grew about one foot per year to reach its current 20-foot height before being sold to TCU, a frequent Hilscher customer,” (TCU This Week). Around 2007 is when the tree brought in for the annual TCU tree lightning began to reach around 40 feet (1). Ever since then, the tree has remained to stand around 40 feet tall. According to Brad Thompson, the tree is picked out in July, cut down in October, and arrives at TCU a week before Thanksgiving. It takes a week to set up and decorate the tree. TCU hires outside contractors to help with the setup and decorations. TCU has continued to use a company called Fifth Avenue Vendors to help transport and garnish the tree (1). The tree lighting was originally held outside of Sadler Hall on TCU’s campus (1). It was an intimate setting that could accommodate the small crowd of attendees in the early years of the event (1). However, as more and more people began to attend, Sadler Hall was no longer a practical location, as it was incapable of holding thousands of people. Therefore, the event was moved to the TCU campus commons, which is centrally located on campus, to allow for bigger crowds. Brad Thompson indicated that this change in location was a controversial move between TCU alumni and organizers of the tree lighting (2). As a matter of fact, Brad Thompson mentioned that he received much blame for this transition. Hate mail was sent to him from previous and current TCU students accusing him of breaking a campus tradition (1). However, according to Thompson, the move was ultimately beneficial because it allowed more people to enjoy and attend the event. When the TCU tree lighting first began it was a small celebration among students and staff (1). Now the celebration is an event that the whole Fort Worth community comes out to participate in. During the current tree lighting celebrations, you can expect to see people of all ages, ranging from babies to grandparents. It was in fact mentioned by Brad Thompson, that more people attend the TCU tree lighting than the Sundance Square tree lighting that is held in downtown Fort Worth for the whole city to see. The current TCU tree lighting event has become much more popular within the community than it was when it began. When the event first took place, around 500 students would attend. Current guests can now expect to see over 10,000 people, not just students. It was mentioned by TCU Junior pre-med major Lauren Tooman, “‘I love to see all of us come together with the alumni and the Fort Worth residents, it makes for an inviting, family friendly atmosphere,'”(TCU 360). The tree lighting is now a community event that families around Fort Worth come to enjoy, regardless of if they attend or attended TCU.